Though it contains all the usual Griffith elements (a sick old mother in her bedroom, a struggling but pure-of-heart young couple, misunderstandings with the police), Musketeers is also a proto-gangster picture. 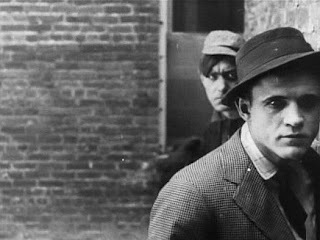 Just as Elmer Booth's gang leader walks towards the camera and stares it down (see the still above), his gaze disrupting the fabric of the film's style, his very presence disturbs other conventions as well. He saunters into several scenes, intruding on the obligatory domestic bliss that Griffith could by now portray in his sleep. The movie also contains some convincing scenes of immigrant street life and urban violence - it's a definite departure for the director, who may have been tiring of his Biograph formula. Not as noteworthy as Musketeers, this short has a simple story, featuring the usual misunderstandings and sympathy for the underdog that are staples in Griffith's Biograph work. There is some complexity here - though the story occurs in a limited setting and time frame, the impact of the actions on each of three characters is examined in detail: the popular man who has been knocked unconscious and whom the police are trying to revive; his brother, who knocked him down, thinks him dead, and is afraid his misdeed will be discovered; and the burglar, who was in the room with the unconscious man when the police arrived and is now being interrogated by them in an attempt to force a confession. All ends well, and leaves the distinct impression that there's the seed of a compelling narrative here, if it was stretched out and complicated. Though the cops are supposedly giving the thief the third degree, it feels more like they're still on the first, working their way up to the second, when the unconscious man is suddenly revived. A highly sentimental, but also charming, tale. Misunderstandings and contrivances are kept to a minimum here (and when they intrude they are playful and don't have an inordinate impact on the plot). Instead, Griffith gets to focus on behavior, where his talents flourish the most. A little moppet, whose mother has died, ingratiates herself with two lonely, standoffish neighbors: a dour spinster and a grouchy bachelor. She even brings them together in the end. Sticky-sweet to be sure, but the little girl's acting is so genuine that it's actually very disarming. In a way, her presence is like that of the gangster in Musketeers, disrupting the usual tempo of the performances. The man and the woman, comparatively artificial, loosen up in her presence and make the film a warm and enjoyable trifle. The chronicle of a dowdy woman driven mad by a false lover, the parallel stories of two newlyweds (one rich, one poor) who are tempted by different sorts of crime, and the race to stop a degenerate gambler from taking his life. The first offers a lonely female victim, the type Griffith would return to in later works, but here there is not much room to develop her. The second film is interesting in that it reminds us (like A Corner in Wheat and The Usurer on the other disc) of the progressive political milieu Griffith considered himself a part of. However, it is sentimental, moralistic, and naive, ignoring larger issues to unite rich and poor in a Sunday-school ethics parable. The third short foreshadows Intolerance's race to stop an execution but lacks the same excitement, having less time to build up the characters, and not demonstrating the same ability to build tension and heighten the excitement through crosscutting. The final film in the disc is certainly lively - chronicling an Indian attack on a frontier town, it also looks to be Griffith's most complicated work up to this point. Some of the tendencies which have been building throughout his Biograph career culminate here - the alternation of shots, the fast cutting, the illusion of space created by juxtaposition - it's amazing how far the director came in five years. Also, though most of the films on this disc show a preference, often to the point of overreliance, for medium shots, the spectacle here manages to widen the scope. Griffith takes as many elements as he can and juggles them, creating a battle of near-epic proportions. And yet it's all just preparation for the climax of Birth of a Nation: the attack on the cabin, with the womenfolk inside (revolvers held to their head just in case the enemy get through and they need to die with their virtue intact); the unthinkingly stereotypical ethnic savages outside (Indians this time around); the charge to the rescue at just the last minute. Battle is one more step in Griffith's movement toward feature-filmmaking. Noticing a pattern in my criticism here? It must be said that, beyond experimental and other basically non-narrative forms, I don't see much use for the short film. Everything that Griffith does here, he can do better with more room to expand on characters, deepen his themes, and make his approach more complex and nuanced. His earlier shorts excite with their sense of discovery, but this second disc mostly shows a restless filmmaker, eager to break out of the constrictions he's found himself in. Hell, after 450 shorts, I'd be ready to move on too.